Quantity Discount Price shown is per Pack of 8. These tags are made of a flexiable plastic. They are only available in eight assorted colors. 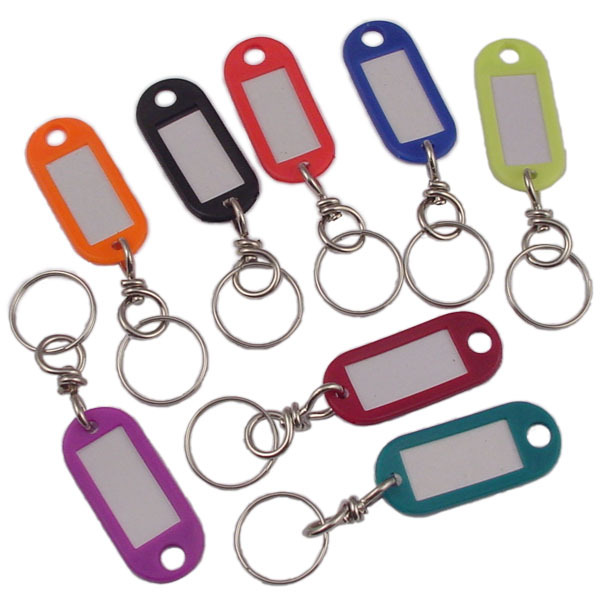 Each pack of 8 contains 1 of each color keytag: Black, Blue, Yellow, Red, Orange, Burgandy, Purple and Teal Green. Tag measures 2'' Long x 7/8'' Wide 1/8'' Thick. Swivel allows keys to hang flat and is 1'' Long. A 1'' Split ring is also included. Paper insert is 3/4'' x 1 3/8'' and is removed thru a slot on the back of the tag. A clear plastic insert protects the paper tag.